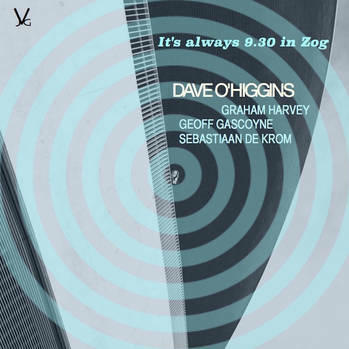 Since bursting onto the UK jazz scene some thirty years ago, tenor and soprano saxophonist, Dave O'Higgins has stuck steadfastly to his roots in the music, but does so whilst sounding utterly contemporary. As O'Higgins releases his new album on his own label, and embarks on an extensive UK tour, Jazz Views catches up with saxophonist to talk about his new album. "It’s Always 9:30 in Zog is my 19th album as leader and third with this group", he says "My previous recordings have ranged from small to large ensembles, acoustic to electric, all standards to all originals, straight ahead to fusion. The quartet comprises me on tenor and soprano saxes, Graham Harvey on piano and Fender Rhodes, Geoff Gascoyne on upright bass and Sebastian de Krom on drums. The new album comprises of eight originals, two tunes written by musicians I’ve worked with and two standards. I’ve recorded albums of all originals and albums of all standards before. Years of gigging has taught me that the audience likes to be reeled in by something familiar and then challenged. This quartet has recorded two CDs of “contrafacts”, this one marks something different that both draws respectfully from the tradition but also unashamedly takes off from there in our own way with a palpable sense of fun and adventure. I felt my regular audience 'trusts' me enough now to let me take them on this journey… Also my compositional sensibility has matured over the years having learnt so many great standards and classic jazz tunes. It’s a good foundation. A good foundation indeed, as the standards sit comfortably alongside Dave's originals. Of the the two standards, he says "'Easy Living' is a ballad I’ve played for years, with a memorable melody with lots of twists and a nice modulation in the bridge. I like to dedicate it, ironically, to jazz musicians. On this recording we imbued it with a hint of 12/8 bluesiness. 'Autumn Serenade' is haunting and romantic in equal measure and my rendition nods respectfully toward Coltrane and Jerry Bergonzi. Thank you for saying they sit well with my compositions!" One of the qualities that is immediately evident when listening to It’s Always 9:30 in Zog is the connection between the musicians, a hard won rapport built up over a period of time. As O'Higgins is keen to explain, "I’ve always been an avid listener, so I’m influenced by lots of different things all the time. I love the acoustic quartet aesthetic, and having worked with these guys for 6 years or more I have the confidence to present them with new ideas and let them bring their ideas and sensibilities to the table, which they certainly do. There’s only so much contained in the manuscript I hand out to the musicians, the rest is all their interpretation and interaction! That’s why I chose them! 3) flexibility on the fly"
If constantly gigging and preparing new music for his quartet was not enough, along with his other regular commitments as a member of the Darius Brubeck Quartet, Kieron Garrett Quartet, Sebastiaan de Krom Trio ( aweekly residency on Sunday nights at the Troubadour, Earls Court) and Ronnie Scott’s Jazz Orchestra (to which he has contributed two originals to the band book), along with his work with Matt Bianco (for which he co-wrote the material on the recently released album, Gravity) Dave also runs his own recording studio, specialising in bringing the best sound posssibe to a jazz ensemble. "It was always a dream of mine, and Judith (my wife) pushed me into actually doing it. She was probably fed up with me going on about it! ", he laughs. "I always loved the sound of Rudy Van Gelder’s 50s and 60s recordings, and felt that rock’n’roll recording sensibilities of the 70s to the present day killed the spontaneity, vibe, swing and sound that they captured so well back in the day. It’s also encouraged a “studio” mentality of “isolation” (sonically) and “accuracy” (what a horror auto-tune is!) which means musicians adopt a different approach to what they do on the gig. To me jazz is about trying to make the album sound like a good gig. Rock’n’roll is about trying to make the gig like a good album." And whilst talking about a good sound, the conversation turns to Dave's set up for his tenor and soprano saxophones. "For the tenor I have two Conn 10m’s, currently favouring the 1941 model over the 1938 one. Both are great. The tenor mouthpiece, I currently using an Otto Link New York Double Ring STM (metal), probably early 1950s, measuring .105 (7*) with fantastic refacing work by Johannes Gerber from South Africa. My soprano is a 1973 Selmer Mk6 with a Bari hard rubber in .58 tip. I endorse Vandoren reeds and use strength 3 Green or Black box reeds. In the studio I use an AEA R84 ribbon mic with and AEA TRP preamp as my primary mic. My preferred live mic is an AEA R92 ribbon mic. I hate SM58s with a passion!" Now in the middle of an extensive 33 date tour, I ask Dave about the logistics of organising such a long tour, and how he finds the opportuities to present his music in front of a live audience, and keeping a regular group working. "It’s actually a 34-date tour now. It took an awful lot of time and heartache to organise, and I’d have lost my shirt without the funding. Fortunately the Arts Council and PRS Foundation came up trumps. And I’ll be wearing a nice shirt." Continuing, he adds, "The only way to keep a regular working band together is to be able to offer them respectable fees! I’m afraid it does boil down to that. Graham Harvey is doing half the tour as he has prior commitments with Stacey Kent. Fortunately the marvellous Rob Barron was available to do the rest." And of his immediate plans after the tour, the saxophonist says "I’m hoping the new Matt Bianco jazz project will kick off next year. Also we do six dates at Ronnie Scotts with Brubeck’s Play Brubeck in January, and just after that I’m in Turin recording Tomasso Starace’s new CD with some great Italian musicians. For more information visit www.daveohiggins.com.